Today was my last day of work at the Downtown Community Health Clinic in Vancouver. I've been a doctor there for the past year and a half. It's an inner city clinic, and my practice has focused on addictions, HIV, Hepatitis C, and mental health. It has always been an interesting place to work, and I have met some great people there. I will miss all of the staff at the clinic, and most of all I'll miss my patients. My patients have been some of the most interesting people I have ever met, I have learned a lot from them, and I will never forget them. 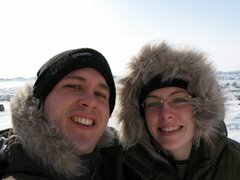 A few months ago my wife (Julia) and I decided that we would take a year away from city life and move somewhere remote, somewhere that was adventerous, and somewhere we had never been before. We've picked 2 potential spots......Inuvik, North West Territories and Iqaluit, Nunavut. Both are really isolated, and will give us a chance to practice really broad spectrum medicine.....I'll get to do obstetrics, hospital work and emerg, as well as family practice, and Julia will be working as a GP-anaesthetist. Next week I will be travelling to Iqaluit for a 3 week locum, and later I'll do a short stint in Inuvik. Based on that we will decide where we spend our year away, and in July we will hit the road. Both Julia and I will be posting here about our travels and adventures. We hope that you will follow along with us on this exciting trip!! We'll try to keep the site up to date with our pictures and stories as the year unfolds.